The work of Roberts Adams is iconic in visual or written text. I’m not trying to push my work in the direction of New-typography. The power Adams commands with capturing of large space is very important. It is critical to the way you approach you work. In time I have come to understand this. For example the two churches I was recently on reviewing the situation after. I didn’t attempt to take a picture in the second empty church. Although it been an empty space and the stronger of the two buildings it felt cluttered. Adams use of space was bold covering what some may see a mundane. The image of the house with all its procession is beautiful in its perfect composition. A plain picture to most we are given various things to read.We have a House, Garden, door, sky, window, shadows, roof, path and grass.The viewer is almost pulled into to tell the story of what is depicted. Your eyes lead up the path to the door into the lady in the living room. However its not a lady it’s a vase perfectly positioned. The viewer is not clear if any human is present inside the house. The reason I picked the image is that the human form gives it a totally different feel. Your focal point is totally different. There is always a clean crisp feel to Adams work. The dark light, which dominates the image gives it a negative feel overall. The viewer dose not feel invited into the house as well as having little knowledge of what is going on inside the house. Is it empty, is it occupied? 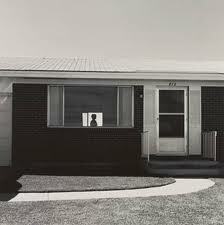 This image by Robert Adams offers a lot less in the way of information but what it does offer is critical. In the image, we have the black building, window, lights, paintings, tops of hedges, blurred trees and the roof. The blurred tree tells us the image is taken in low light with a longer exposure. The bright light peering out of the darkness gives the feel of a family environment. Again Adams places the light and pictures perfect on the divides between the windows. Your eyes are pulled into the shot from left to right to the warm glow of the window. Concluding on the two images that I have looked at shows the relevant signs that life have on an image. It tot tally changes the viewers opinion of the image. 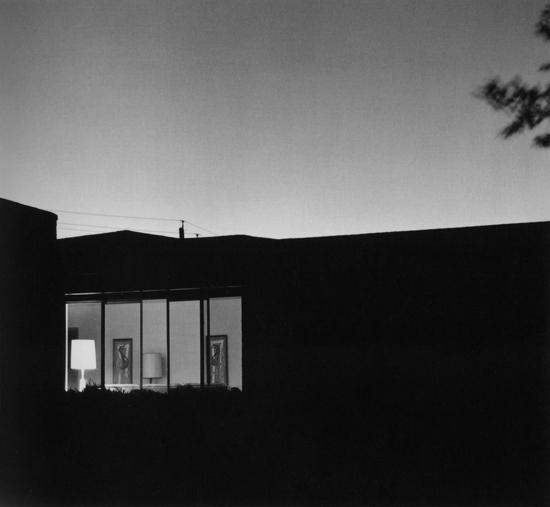 The light been on in the house creates a visual syntax of safety in the darkness. The closed door on the house creates a vision of un-welcomness.